NORMALLY it would take Belinda Hampson's children a stressful - and normally shoeless - 40 minutes to get ready for school every morning. But that was halved on their first day today, thanks to the Sydney mum's clever organisational hacks. 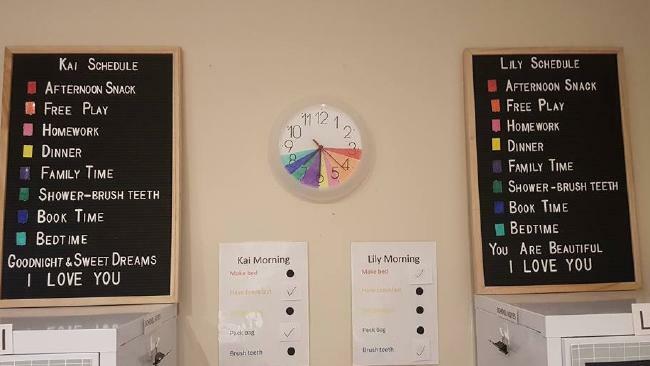 The 35-year-old Cranebrook mum spent many shopping trips trawling through Kmart, the Reject Shop and Bunnings to create a back to school area for Lily, eight, and Kai, five, to get ready for a big 12 months at a public school in the city's west. "Shoes are the biggest issue in the morning - they either cannot find one or both. "News and library days were always different for both kids. "Letters home from school always got put somewhere and the kids couldn't remember where, and school uniforms, bags and lunch boxes were all in different locations - so I brought them all together." 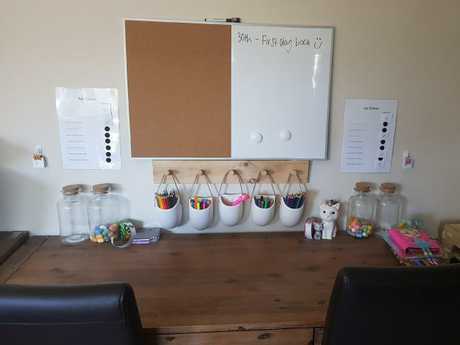 Ms Hampson said she started by finding the bigger items - the lockers, storage tubs and pinboards - and added finishing touches to create the perfect space for just $200. There is a to-do list, a tub for snacks, hooks for bags, a Monday to Friday schedule - even a hairbrush hanging exactly where it should be. 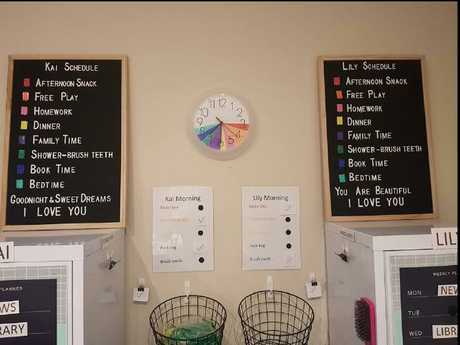 She has also created a clever coded clock system with different colours indicating different activities for the afternoon. And so far, it's been life changing. "They try to beat each other finishing the tasks and my daughter loved the 'you are beautiful' at the bottom of the schedule board. "I always tell her she is beautiful inside and out - she has had a few kids over the years tell her she wasn't, so it lifts her up to see that every day." 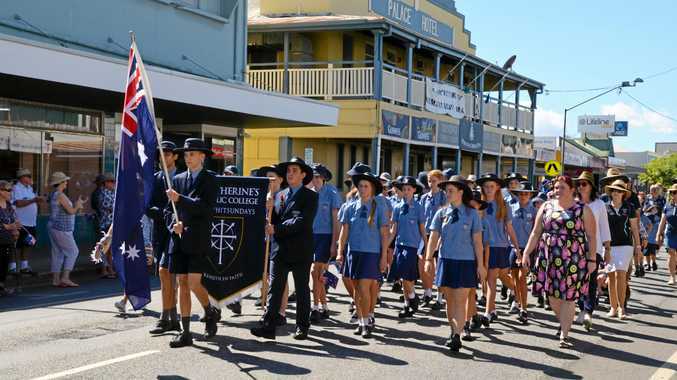 Ms Hampson said having a dedicated school storage environment at home was sure to teach the children structure, discipline, as well as help them respect their belongings and take pride in their work. To achieve the end result, Ms Hampson moved the family's dining table, so a new-and-improved study desk was close to their 'school area', and so she was better placed to help the children with homework. "It really has given them more incentive to help and get themselves organised," she admitted. "I was always organised at work, but as the kids get older it is getting easier to organise things - plus there are a lot of pages out there that help inspire me. "Mornings have always been hard to get ready as things were everywhere, but now with putting it all in one spot it is so much easier. "What would normally take 40 minutes to do only took 20 minutes this morning - and it was stress free. "The response I've had from other parents has been amazing - I hope it has help inspire a few mums out there and help them and the kids." And the best part? It wasn't as hard as it looks. "It really wasn't - there have been a lot of mums posting inspiration to help get me started then it just went from there," she said. "I just wrote out a list of things that we needed help organising and then found spots for them. "To other parents who don't know where to start, I would say make a list of things that you want to change and what would help to change it. "Look to some Facebook pages to help get inspiration." 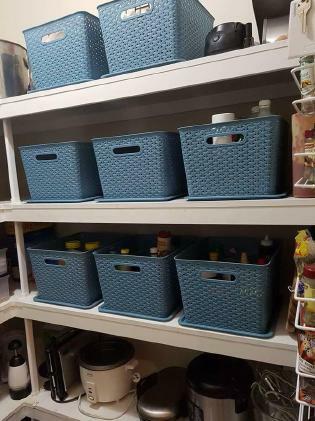 Ms Hampson has also reorganised her pantry using various-sized storage tubs and containers, making mealtime a breeze. 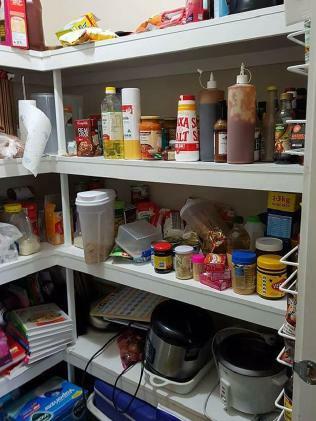 "I am in the process of finishing off the kids desk station, my pantry and linen closet," she said. "I haven't done many DIY projects before but I love to move furniture around or change things up a little. "I have always loved interior design and I worked in a furniture shop for three years - I loved the fact that I could move things around and decorate all day. 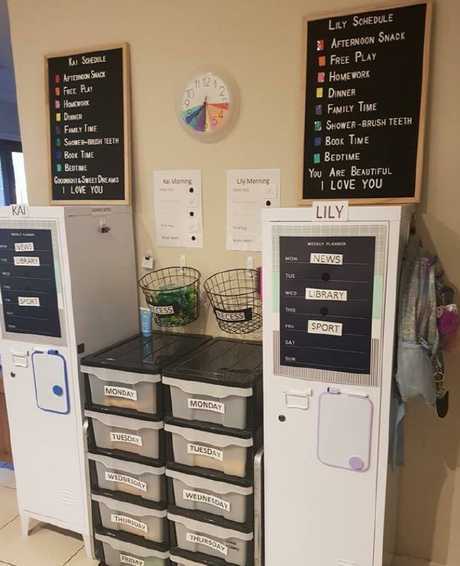 "To organise the school section I had to move furniture around in four rooms - but I loved every minute of it."